Automate messaging with Slack and Infusionsoft. Threaded communication is what Slack does best. It's like Skype and FB Messenger combined with group threads and historical access all in one. In short, it's an awesome tool to be integrating with Infusionsoft and that's exactly why we did it. Setup is straightforward and painless. We walk you through it in the video and our setup screen has a link directly to where you attain the Slack Webhook URL in your app. Once setup, you can easily create multiple different Helpers for multiple different Slack Channels. A channel in slack is a threaded discussion group/channel. 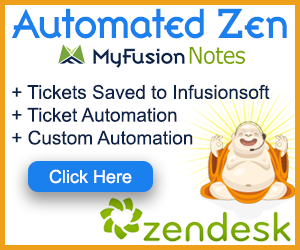 Hello and welcome to MyFusion Helper. My name is Troy Broussard and in this video I’m going to show you how to use the Slack It Helper. Now this particular Helper integrates Infusionsoft with Slack. Now if you haven’t had a chance to check out Slack, it’s a very powerful group based messaging platform. I won’t go into more detail than that, you can take a look at it, but it’s similar to Skype or similar to Facebook Messenger only it has a lot of permissions and control features designed for teams working together. Now in this video I am going to show you how to set up the Helper inside of our application. I’m also going to show you how to connect it to Slack and how to set up the webhook. It’s very easy and it’s just copy and paste, so we’ll go through all of that. Then I’m going to show you how to deploy it inside of Infusionsoft as well. Then we’ll also look at a real time example and run it for you so you can see it working real time and see how it all works. Then at the end we’re going to come back and wrap it all up. I’ll just give you some examples of how you can use this in your business and how some of our clients are using Slack integration in their businesses. All right? So let’s dive right in. Okay, so the first thing is we need to create a new Helper for Slack. Now I’ve already logged into the application and I’m just going to go here and click on a new Helper. I’m going to type in “SL” and it will pull up Slack. We’ll do a Slack Demo as the name and go ahead and click to configure that Helper. Once it pulls in, we’re going to go through a process of getting everything all set up. It says right here we’ve got a link that says, “Set up an incoming Slack webhook.” This is what we need to paste in right here for the Slack webhook URL, so I’m going to go ahead and do that. I’ve already launched that link open here in another tab so that we can see it. It has got our URLs for the different webhooks. I recommend you log into your Slack account first before you click that link, that way it will pull up the right webhooks integrated with your app. So now I can go ahead and grab one of these and copy it. Then we’re going to come back in here and paste that in. Now when Slack gives you these URLs for the webhooks, it focuses them to an individual channel. I don’t want you to worry about that because we can override the channel to be anything you want here. So just go ahead and select the top integration here, that’s fine because we’ll be able to do different channels without any problem at all. Okay, so now we come back and we’ve got that webhook integrated. We can put our username or if we want this to come across as being from Infusionsoft we can do that. Then I’m going to go into my Slack account here and just pick a channel so I’ve got some different channels. I’m just going to pick this random channel and we’ll put it in there. So we’re going to use “Pound Random” as the name of our channel. So we’ll go here and do “Pound Random.” Then we can put whatever message and merging we want in here. This can be whatever we want to do and I’ll just do a merge just to show you that it can merge those fields in and we’ll set that up. So we’ll go ahead and do this. Now obviously this message is just a canned, lame excuse of an attempt to show you a demo here and you’ll use it much more useful than that, but that’s really all there is to setting it up. Now we can go ahead and copy that link and we can come into Infusionsoft and I’ve got a little demo app here. So I’m going to paste that in and go ahead and save that. So let’s go ahead and publish this out. It takes just a second here, and we’ll publish that. Okay, so there’s nobody in there and nobody queued up. What I’m going to do is go grab a contact and we’ll just do a contact here. We can just do it here, we can just start a campaign so I don’t have to waste a tag on this demo and all that good stuff. We’ll just start it in here and I’ll pull up the Slack demo and then we’ll go ahead and add it right into that sequence. So we can process that in and that should take just a second here. Okay, so that’s all set. So now we can go back to our--I’m going to open up in another window. We’ll open up this campaign in another window so we can see it and we’ll go ahead and pull this Slack demo up. I’m going to leave it in the performance view so we can see that and you can see that it already went through. It already processed, so it moves pretty quick. We can confirm that, we can go ahead and go into Slack and look in this random channel that I created. Then you can see, “Hey, Slack is cool, Mr. Slacker.” So it merged in the last name and you can see that it came from Infusionsoft which is the “from” field that we set up. So, that’s all there really is to it. It’s custom messages and routed into a specific channel of your choosing. And really that’s all you have to do. Okay, so let’s jump in and talk about some examples. Now this can be useful in a lot of ways. I’ve seen people use it for tracking actions inside of membership sites where they want to have a log of what’s going on. So they create different channels for different sections of the membership site and log users’ behaviors there. It’s a way of just getting some feedback of what’s going on in the site and seeing what people are using. So that can be very useful. Another thing that we’ve seen, and this is probably the most common use, is debug logging and testing. I know that I use this a lot for testing out messages when I’m deploying a new campaign for a client. It’s fairly sophisticated. I want to track where everything has gone through and I don’t necessarily want to clutter up their app with a whole bunch of notes and tags and goofy stuff. So I can just use this to provide logging inside of a Slack channel. Then I can name the channel for that client and that particular campaign that I’m working on and have some great tracking and debugging in it. Another thing you can do with it is internal messages and monitoring. When you’re using Slack properly in a team environment, this internal messaging is very, very powerful because you can really use it like a substitute for the tasks in Infusionsoft. Now clearly it’s not going to have completion dates and all of that kind of stuff or trigger automation, but a lot of times you want to pipe this into a channel inside of Slack that you can log or make sure the right people are taking action. So think of it this way, let’s say you have a person on your team that is responsible for calling all of the credit card declines or credit card failures on your membership subscription. You could automatically put a message from Slack into that channel for billing or credit card failures and only have the person on your team that needs to see that have access, but also maybe the admin or the owner of the company as well. This is so they can follow up and see what they’re doing in that channel, if they’re calling people up and getting them to convert or whatever. Those are a couple of different examples. Logging, inter-team communication and action tracking are probably some of the greatest examples of this, but I’d love to hear what you use it for. I’m sure you’ll come up with some more creative uses, especially you power users of Slack for sure. All right. Hopefully this has given you some good examples and at least allowed you to get it up and configured. If you have any questions at all, just reach out to us on the Help Desk at help@myfusionsolutions.com.